Hitchcock / Truffaut: How To Design a Brilliant Book Cover, and How Not To. Hitchcock/Truffaut is a 1966 book based on a historic series of interviews between two cinematic legends: François Truffaut and Alfred Hitchcock. 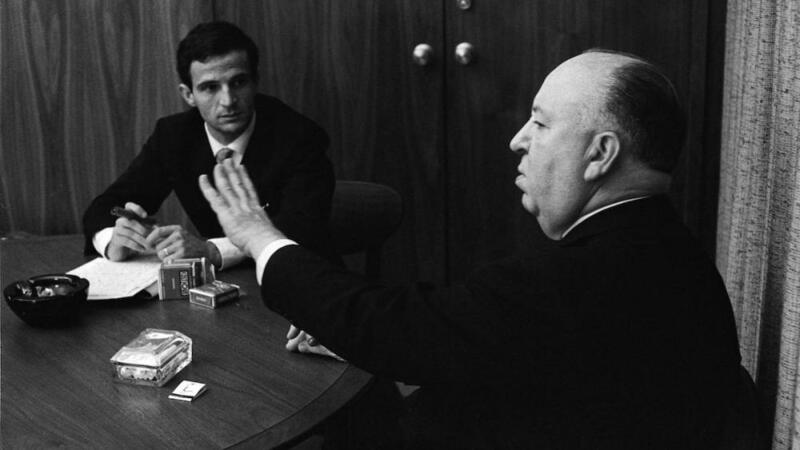 Truffaut flew from Paris to Los Angeles in 1962, where the two directors spent an entire week sequestered in a room at Universal Studios, talking extensively about Hitchcock’s movies and filmmaking in general. Let’s take a look at the design of the two book covers, which share many elements but could not be more different in their results. The original 1966 book cover is a near-perfect design. It is the essence of the Modernist pursuit of “intellectual elegance” – eliminating the superfluous to allow the essential to shine more brightly. In this design, skillfully kerned type is dramatically enlarged and arranged at an unexpected angle, and then aligned to convey the idea of “meeting of the minds.” This design is not just visually beautiful, it’s also an accurate distillation of the book’s content – an intimate conversation between two people. The achromatic color palette may be a sly reference to Hitchcock’s superlative black and white cinematography in his early films like Notorious, Rebecca, and Psycho. A small subtitle is deliberately minimized and isolated, so as not to detract attention from the beautiful typographic composition that is the focal point of this design. Another hallmark of Modernist design thinking — restraint — is demonstrated by what is not present in this book cover design. An easy solution would have been to include a cliched photograph of a film projector or a director’s chair. And imagine the temptation to add still images from Hitchcock’s films. Some of the most iconic scenes in cinema history were Hitchcock creations, from movies like Psycho, Rear Window, Vertigo, and North By Northwest. I can imagine a publisher or marketing department pushing to add photos from famous films to potentially increase sales. But the designer’s restraint puts the focus on a few crucial, beautifully arranged elements: one typeface, two type sizes, two colors, and one bold idea. The resulting design is a powerful, evocative triumph that literally cannot be improved. Which brings us to the second cover design, which is the 1985 revised edition of the same book. What was once elegantly simple and direct is now busy, complicated and hard to read. Why were these changes made? I’m guessing the publishers felt a need to update the original design to make it clear that the revised edition was something new. But that could have been handled with more discipline and subtlety, achieving a much better result. For example, something as simple as reversing the color palette (black type on white background) would have created a new look while retaining the structure of the original design that was so beautiful. This case study is a perfect example of “less is more” and knowing the power of restraint in design. Inexperienced designers consider a project finished when they can’t think of anything else to add. Masterful designers consider a project finished when there is nothing left to take away.